Undergoing surgery for a broken leg is a traumatic event. It involves a complicated and invasive surgical procedure, trauma to the venous and lymphatic systems and extensive and often painful rehabilitation. Unless you have experienced it before, this will be a confronting and often confusing experience. I made many mistakes. You will too. Here are some you might avoid. 1) Presuming that your surgeon will involve himself in post-surgical care. The surgeon will not. They will open you up, insert a plate and screws in the shattered bones, sew you up and say, “See ya later.” They see their role in a very limited way. They are carpenters and believe it’s not their responsibility to see if the plumbing in the new house is working or the electrics are correctly installed. They don’t give a stuff about the final colour of the house. 2) Being too aggressive with upper body exercises while in a wheel chair and crutches. Being immobile drove me crazy so I set goals for both daily wheelchair miles and also journeys on crutches. I also steadfastly refused to let anyone push my wheelchair, even up steep footpaths and road level crossings. This was excessive hubris which left me with impinged shoulder tendons and a strained muscle in my right forearm. Be patient and don’t be too proud to let people push your wheelchair. 3) Leaving too long a gap between accident and surgery. It was more then three weeks between when I broke my leg and when it was surgically repaired. This is too long. By three weeks the bones are well into natural healing and knitting. This required me to have the bone broken a second time so it could be re-set. In my case, through a variety of circumstances, including an original mis-diagnosis in Canada, I could not avoid the delay. For most people surgery should be immediate or at least as soon as the swelling has subsided sufficiently for the surgeon to open you up. Don’t spend weeks deliberating about it. 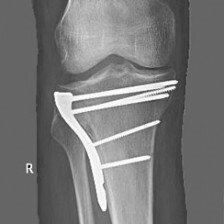 4) I did not practice elevating the injured leg both before and after surgery. No-one told me to do this, not even in hospital immediately post surgery. The first minute you wake up after surgery you should ask for a pile of pillows and put them under your leg even when lying prone. Henceforth, you should always sleep with the leg elevated, even if it means jacking up the foot of your bed with bricks or telephone books. At work sit with your leg up on a desk or on a chair. When at meals, and particularly when sedentary, eg watching TV, the leg should be way up. If you can get it above the level of your heart that’s perfect, but any elevation is good. The blood and oedema all run down hill. Your vascular and lymphatic system needs all the help it can get in the early stages to get the junk out of your leg and expelled from your body. By the time I started elevating my leg it was too late and I had acquired a DVT.